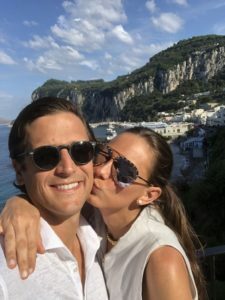 Recently getting married in Ravello and honeymooning in Capri and Positano, I feel like I have gotten to know the Amalfi Coast pretty well. 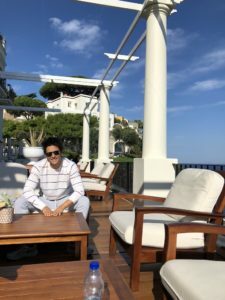 I have been vacationing in Positano for the past couple of summers so this city was initially my favorite until I really got to spend some time Capri and Ravello. All 3 cities are very different and special in their own ways. When deciding where to visit in the Amalfi Coast it depends on what you are looking for. In this post I’m going to break down each city and why I would choose to go back below, although I will definitely be going back to all of them! Choosing the right time to visit is also very important. Many of these towns are only open May-October and after staying in all of them in both May and July- October, I think the best month to go is September. While I was in Positano and Ravello this past summer during the month of May, it rained every single day. Last summer I visited in August and the towns were super crowded and it was extremely warm. This year when I went in September, the weather was absolutely perfect. 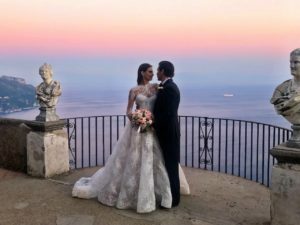 Ben and I got married the last week of September in Ravello then traveled to Positano and Capri for the first week of of October. Towards the end of our honeymoon (beginning of October) restaurants and beach clubs were beginning to shut down for the year, but it didn’t affect our trip. Weather is a total crap shoot with these cities but from now on I will go during the month of September if possible. 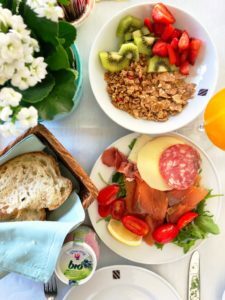 Now for a little break down of where to stay, what to do and most importantly places to dine! Let’s start with Ravello, Italy. I first came to Ravello back in 2010 when my mom won a cooking class trip to Mamma Agata in an auction. 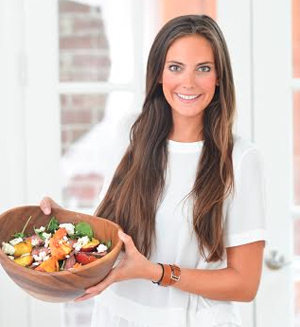 Mamma Agata is a world renowned chef whom has a family run cooking class in Ravello. 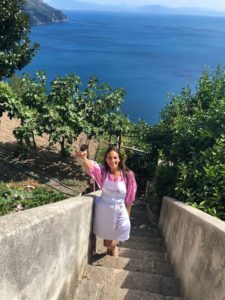 The class is located at her home/garden and she and her family teach you all about Italian cuisine while overlooking the Amalfi coast. 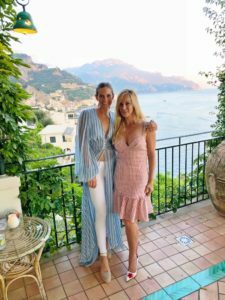 I had recently graduated high school and my passion for cooking was just beginning so for gradation my mom gave me this mother/daughter trip to Ravello to attend her cooking class. 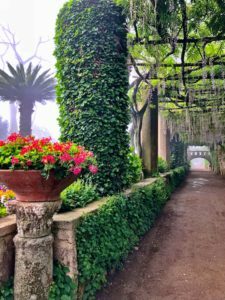 I fell in love with Ravello right away. The town is so unique and charming, not filled with hundreds of tourists like some of the other cities. It is a medieval hilltop village and there is not a lot to do in this town, but it is the most beautiful place I have ever seen. It is located on one of the highest points of the Amalfi Coast, so as you could guess, has unbelievable views. Ravello has some exquisite hotels, great local Italian restaurants and beautiful handmade pottery shops. 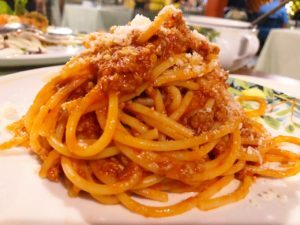 If you are coming to Italy for shopping and fine dining this is not your place, but that is what I love about it. It is quaint, boutiquey and magical. 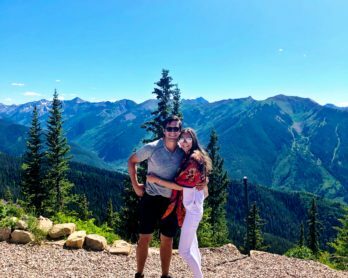 It was named the number one spot to go on a honeymoon and I agree with that statement. It is a place you go to take in the scenery, enjoy the beauty around you and the company you are with. 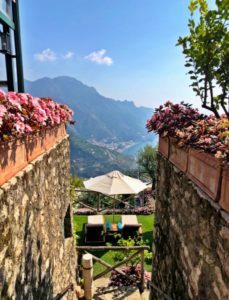 This 12th century villa converted five-star deluxe hotel located on the cliffs of the Amalfi Coast 1,000ft about the Mediterranean is one of a kind. From the staff to the interior decor and beautiful views, this hotel exceeded all my expectations. Their main restaurant, Rossellinis, has even earned 1 Michelin star. 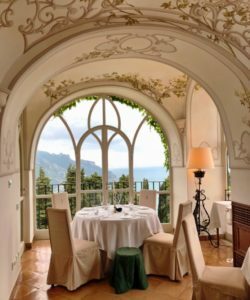 I have stayed at a couple of the five-star hotels in Ravello (and there aren’t many) and this is my favorite. They truly make you feel like home here and a part of their family. 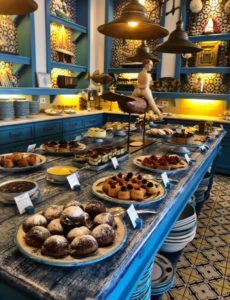 After staying here just 2 days they had my breakfast order memorized, the staff all called me by name and knew exactly what pillow I preferred to sleep on. I am a hotel snob and after staying here for 10 days I can honestly say that there was not one thing I would change about this hotel. Added bonus, they have a private beach club located right on the Mediterranean with a beachside restaurant. Located on an awe-inspiring park, this five-star boutique hotel is a bit older than the others but just as magical. The grounds of this hotel are worth the stay alone. With only 19 rooms in the whole hotel, it has that small intimate feel. I had my wedding reception and ceremony at this hotel and they did a fantastic job. The grounds of the hotel are vast which allows for many different options for event locations and each one is more beautiful than the next. This is a truly extraordinary spot that I will be visiting again. Only disadvantage- you cannot get to this hotel by car. It is a 10 minute walk from the square so you have to be willing to walk a lot. Also, the rooms are a bit outdated. This 11th century five-star hotel is located right next to Palazzo Avino. Known for their striking infinity pool this hotel has lots to offer from their beautiful rose gardens to the regal interior decor. The rooms are similar to Palazzo Avino, but a bit pricier. I personally have never stayed at this hotel so I can’t say much about the accommodations. I did have my rehearsal dinner here though and they did a magnificent job. The staff was wonderful to work with and the gardens were stunning. 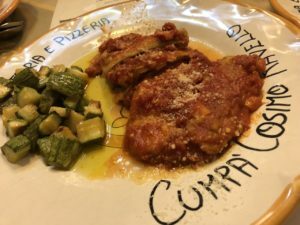 Cumpa Cosimo– This family run authentic Italian spot is one of my favorite inexpensive restaurants in Ravello. It is cozy, the food is delicious and the staff is sweet as can be! Order the pasta sampler for a taste of all their favorites, you will not be disappointed. Rossellinis– This 1 Michelin star restaurant located at Palazzo Avino is a must for a foodie. 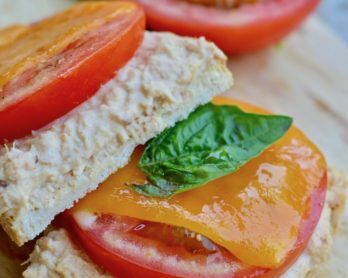 Although formal and a bit stuffy, the food is inventive and worth the experience. It is super pricey but a must for a one time visit. Indulge in the tasting menu and you will leave very satisfied. Il Flauto di Pan– This beautiful restaurant located at Villa Cimbrone is another high-end dining experience. It is a special occasion spot with jaw-dropping views and Michelin star food. 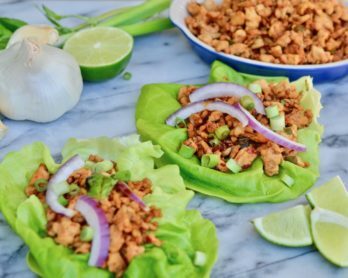 It is definitely on the pricey side and a long, drawn out meal- more of an experience than a dinner. 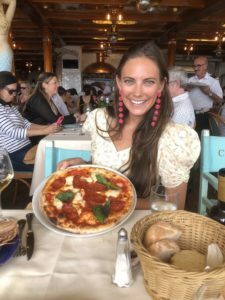 Mimi Bar Pizzeria– Probably the best pizza we had all 3 weeks in Italy tied with Chez Black in Positano. 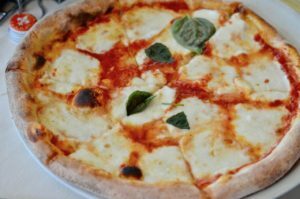 This casual pizzeria is a must in Ravello. We tried 4 different pizzas and all were incredible. From the chewy homemade crust to the fresh tomato sauce and all the different assortment of toppings, I had to come back here multiple times. The garlic pasta was delightful as well! 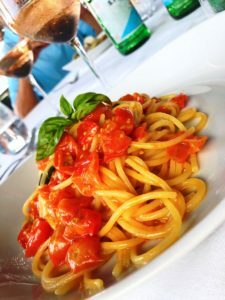 Restaurant Santa Caterina– Just a short 20 minute taxi ride down to Amalfi, this high-end restaurant located in the famous Santa Caterina hotel is a very lovely dining experience. Ask to be seated outside so you can enjoy the fresh smell of the sea and sounds of the waves crashing. This romantic spot makes for a perfect date night. Make sure to top off the night with the lemon soufflé. 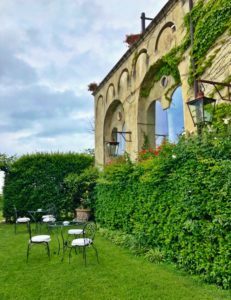 Villa Cimbrone– If you are not staying at this hotel I highly recommend visiting to walk the grounds and gardens. They are filled with impressive decorative elements from all over the world including statues, fountains, temples, pavilions and much more. The views are absolutely breathtaking as well. You could easily spend a couple hours strolling through here. Shop– Walk around the village to all the local pottery shops and art galleries. There are some beautiful cashmere shops as well! 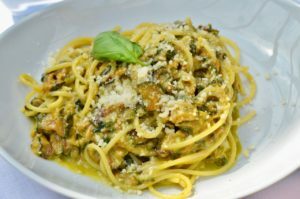 Take a cooking class– Mamma Agata is my favorite but the town has a variety of different ones. 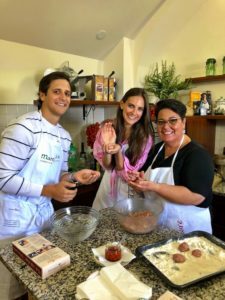 Attending Mamma’s cooking class would be my number 1 suggested thing to do in Ravello. 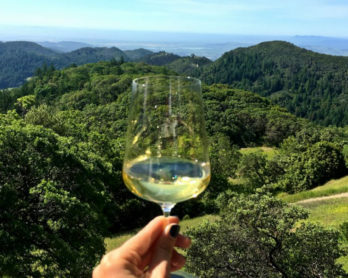 It is a lot of fun, you get to drink her wine made on property and the food is incredible. I have taken her class twice now and have learned so much about the Italian cuisine. It is a truly memorable experience. **Make sure to book in advance. She books from 6 months to a year out and availability is limited. Visit pompeii– Located just 45 minutes from Ravello, this once Roman City is a must see. Pompeii is an archaeological site that was once a thriving town now buried under meters of ash after the eruption of Mount Vesuvius in 79 A.D. I will never forget my visit. 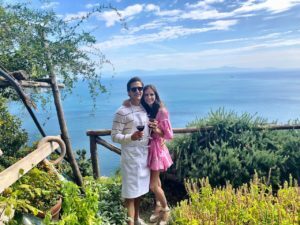 Hike to Amalfi– In less than an hour you can hike all the way down to the small town of Amalfi located right on the water. They have tons of cute local shops and causal bistros that you can pop in for a cheap lunch or glass of rosè. If you’re too tired to hike back after you can easily get a taxi back up to Ravello! 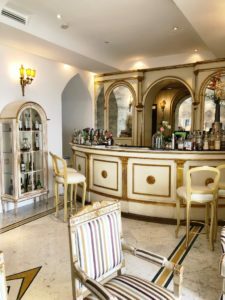 Drinks at Bubbles Bar– Located on the terrace of the Belmond hotel, happy hour here is a must. Have a glass of champagne, order a plate of oysters and request your favorite song to be played by the entertaining local piano player- he’s a blast! I could sit on this patio all night long listening to him perform! This is the first place Ben and I traveled to on our honeymoon. We took a private boat over from Amalfi (just below Ravello) and it took less than an hour. 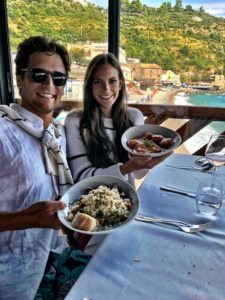 We decided to stop along the way, going through all the grottos, diving in the water and of course dining at my favorite lunch spot, Lo Scoglio Da Tommaso. 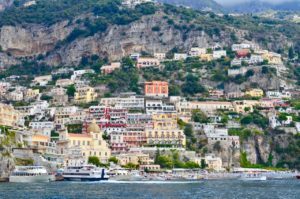 You can also take a ferry between Amalfi, Capri and Positano as well. 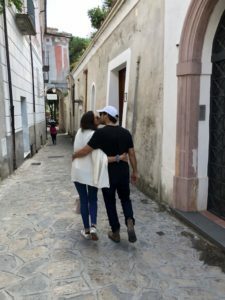 I had been to Capri before but never actually spent time there, I just had taken day trips. One thing that surprised me after staying here was how large the island actually is. Everything is pretty spread out so dinner could be a 30-45 minute taxi ride, which was not what I expected. The island itself is filled with every designer shop you could imagine, a great restaurant scene and some amazing beach clubs that make you feel like you’re at a Las Vegas pool scene (but way nicer). 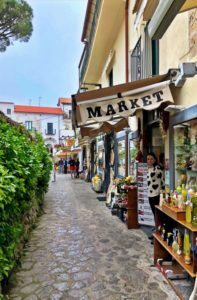 Although it can be a trek to get to, once you arrive to Capri you will understand why people make the journey to get to this bustling island. 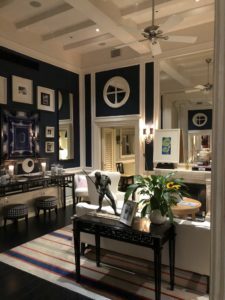 J.K. Place– This chic boutique hotel is where Ben and I stayed on our honeymoon. Located right next to the Marina Grande this sophisticated villa made for the perfect honeymoon spot, it truly felt like home. It was away from the main town/tourists and such a place of tranquility. The pool is amazing and the service is impeccable. We wanted to bring the waiters home with us! The rooms are very spacious as well which was a pleasant surprise as you don’t get that much in Italy! 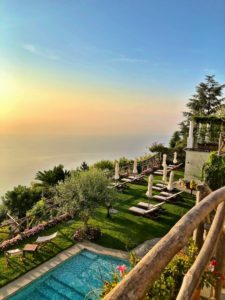 Caesar Augustus– Located on the hilltop of AnaCapri this family-run villa turned hotel was once owned by a Russian prince. Stay here for the postcard views of the Bay of Naples and to escape from the bustling town of Capri, it is like your own relaxing oasis. Drinks on the terrace are a must for the ultimate sunset photo. Grand Hotel Quisisana– Located right in the center of Capri this hotel is perfect for those that want to be in the middle of it all. You can walk to all of the great stores and fun restaurants- it has a lovely piano bar as well! 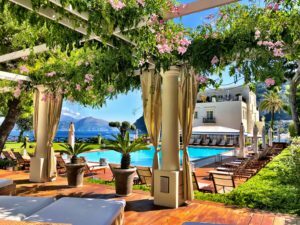 Capri Palace Hotel and Spa– located in the heart of Anacapri this elegant hotel is the only spot on the island to have a Michelin star restaurant, 2 to be exact. It also has a world famous medical spa and a beach club that are a quick free shuttle away. It you are looking to get away from the lively streets of Capri for some relaxation this is your spot. 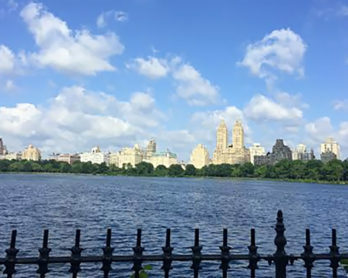 Aurora– A lively hotspot, this place is a celebrity see and be seen for a reason. 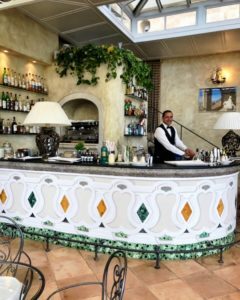 The restaurant is full of energy and serves traditional Neapolitan cuisine by waiters dressed in matching black and white uniforms. It’s an elegant spot to dine for a night out on the town. I would not miss this one! Da Paolino– Talk about a picturesque place to dine! This restaurant is located in the middle of a lemon grove. Some say this place has become too touristy but Ben and I loved our experience. The food was fabulous, the scenery was beautiful and to top it off they have a “sin room” full of every dessert you can imagine. This is my kind of spot! Beware, the portions are super hefty here- I recommend splitting everything! Il Riccio– Ben’s favorite spot of this trip. This chic beach club/ lunch spot is a perfect place to spend an afternoon. 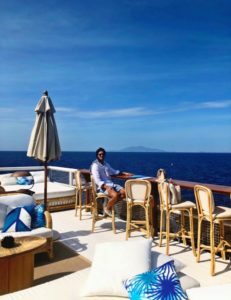 Have drinks at the lounge up top next to their DJ who plays all the best hits then go down below to their Michelin star restaurant for some lunch. We loved the basket of fried specialties and the salt crusted fish was heavenly. If you aren’t too tired or full after lunch, you can go for a dive into the Mediterranean or back up to the lounge for a few more cocktails. La Capannina– Right in the center of all the action, this cozy spot serves excellent Italian cuisine and has quite the extensive wine list. Try the spaghetti alle vongole, it was our favorite dish of the night! 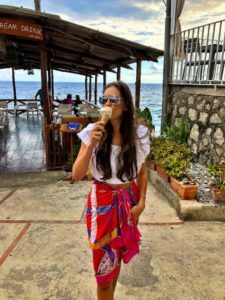 Shop– Capri is filled with every designer shop you could ever imagine from Gucci to Pucci to Prada to Fendi, you name it, it’s here! But besides all of the high end places my two favorite shops were 100% Capri and Bottega Capri. 100% Capri does come with a hefty price tag but the linen is beautiful and so worth a piece or two. The romper I purchased here was my favorite purchase of the trip, minus some kitchen pottery of course! Bottega Capri is a handmade sandals store with the most stunning selection- I have been buying sandals here for years! 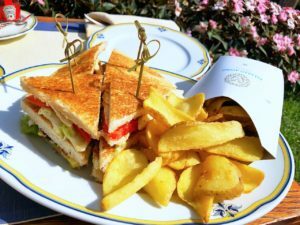 Spend the day at a beach club– Whether you decide to go to Il Riccio or La Fontelina, I highly recommend spending a day at one of these lidos. 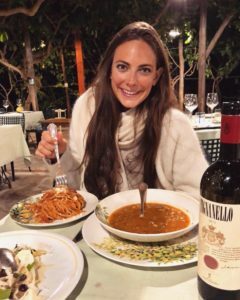 We preferred Il Riccio to La Fontelina but some people said it just depends on what month you go. Rent a boat to take you through the grottos– Being on the water is always my favorite place to be! 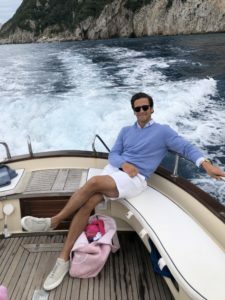 Whether you have a private boat take you to Positano or just through some of the caves and grottos around Capri, you will not be disappointed. The water is magically blue and refreshing, an excellent spot to spend the day sipping on rosè. If you rent the boat for a full day, have your driver take you to Lo Scoglio Da Tommaso. 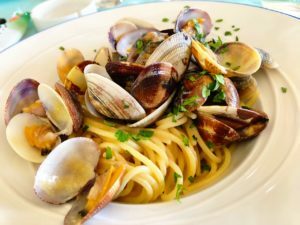 It is a family-owned trattoria with panoramic views of Nerano Bay serving fresh caught seafood and produce grown on their own farm. 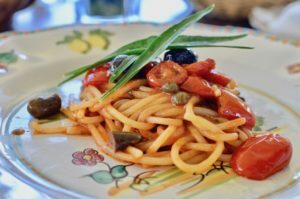 Must try- the Spaghetti with Zucchini, Pasta Pomodoro and Lobster Linguini. 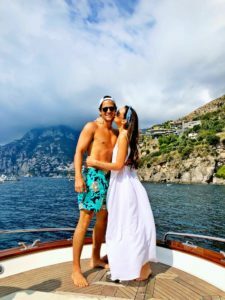 ** We rented our boat/driver through our hotel but I believe you can rent boats from the Capri marina as well. 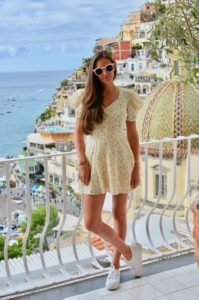 I hope this guide is helpful for you while planning your trip to the Amalfi Coast. It really is a slice of heaven on earth and will always be my happy place. Please let me know if I forgot anything or you have any questions! And don’t forget to comment where your favorite spots are as well. I love to try new places!